YASSS! Says the morons who can't get enough of a bad thing and have no clue as to how stupid they appear when they write YASSS. 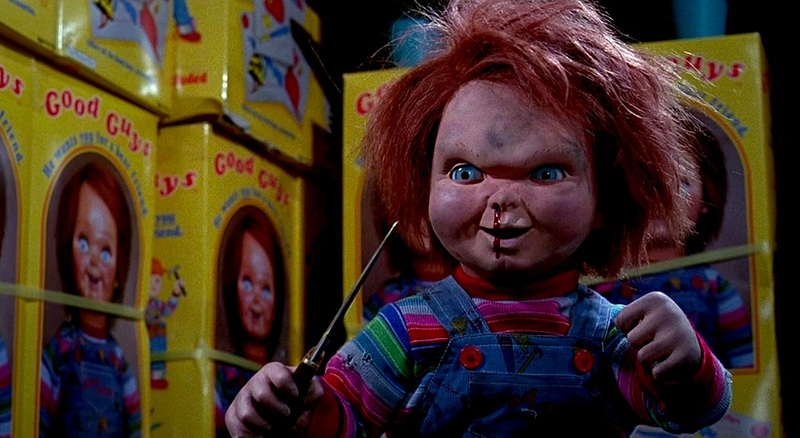 Chucky is returning and this time it's to the small screen as a tv series that will either be on a channel you don't have, SyFy or a special app that only cost 9.99 a month. I'll probably give the series a shot, or watch the first episode at the very least, because up until Cult I have enjoyed all the other entries into the series and really "How much worse can the series get after Cult?" But if the series that no one asked for continues down the hole of stupidity I prefer the franchise just die quietly until I'm in my 70's. Anyway, Mancini mad the announcement over on twitter with a gif that tries to play off my nostalgia of tracking VHS tapes and TVs that you had to adjust the vertical hold on. To that point he succeeded and has my interest. Dourif will be back to voice the Iconic killer doll and the season will consist of 8 one hour episodes. Other than that no word on if this will tie into cult or if Glenn, Glenda or Tiffany will make an appearance.